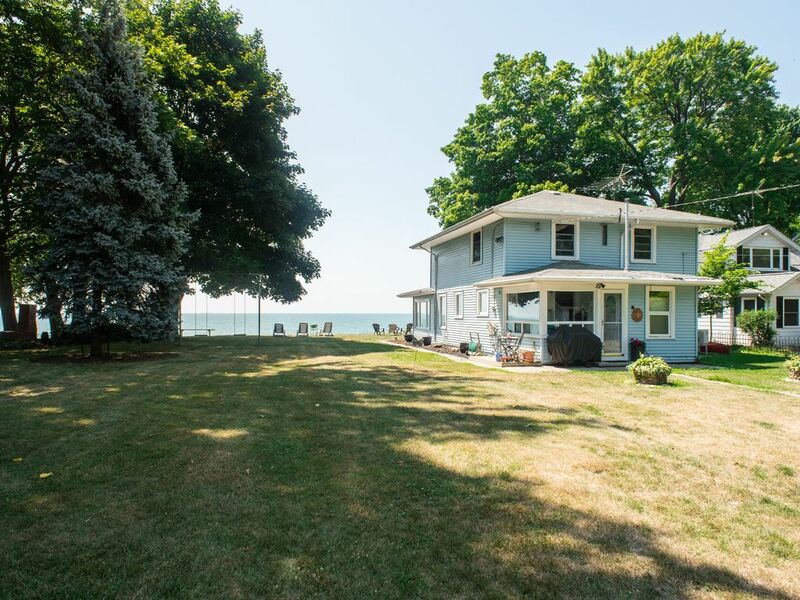 A well-equipped 3 bedroom house with 2 bathrooms, a sunroom and a spacious garden overlooking Lake Erie. There is easy access to the main beach just 1 min walk away. This house is an excellent place to escape the hustle and bustle for a quiet weekend away. The surrounding area has plenty to entertain you including wineries, golf courses, cycle trail and not forgetting the beach and lake. The downstairs of the house features a fully equipped kitchen, dining room, lounge, bathroom and a spacious and light sunroom. Upstairs there is a master bedroom overlooking the lake and two other double bedrooms, and a second bathroom. All bedrooms have queen beds and ceiling fans. In addition to the 3 queen beds, the down stairs sofa pulls out to make a double bed. The spacious garden gives you uninterrupted views of the lake. THe house is heated by 2 gas fireplaces with thermostat controls and mitsubishi heating and cooling unit. The Dining room is excellent place for an evening in catching up with friends,a family dinner or a romatic date night. The spacious lawn not only helps create that away from it all feel, the steps lead straight down to the lake. Lawn chairs, table and seating is provided. We had a wonderful stay at this lakefront house. We were in the area for a wine and mac 'N cheese event. It was centrally located to all the wineries. Our host, Cathy, recommended several good restaurants for breakfast and dinner. The house was very clean and toasty warm at this time of year. We would love to come back and see the area in the summer time. Thank you for your review we are pleased that you found the house warm - we have recently put new doors and windows in on the lake side. We look forward to you returning again. Absolutely amazing place!!! Looking forward to rebooking in the future. This place has the best panoramic lake views!!! Location was perfect for wine tours! Would recommend it to everyone. This was my first experience with Homeaway and Cathy was a welcoming host. Her home was very nice, clean and very well equipped. The pictures do not fully do her place justice, it is even more beautiful upon arrival! Cathy’s home is upkept to high standards, with extremely comfortable mattresses having spotless clean crisp bedding. There were plenty of fresh towels and high-end finishes/touches throughout the home. The main floor home has outstanding lake views and is a perfect place to relax with many cozy places to sit complete with fluffy throw pillows, blankets and a lovely fireplace. Cathy was very helpful by replying quickly and provided a list of restaurants and wineries near her place; which did not disappoint. If you want to be in a quiet comfortable home away from hustle and bustle of busy city living, then I would recommend booking Cathy’s beautiful home! Thank you for your review I'm pleased you enjoyed the house so much. We hope to have you as a guest again soon. A warm welcoming and very well stocked cottage. Spectaculour view and close to numerous wineries! A warm welcoming and very well stocked cottage. Spectaculour view and close to numerous wineries! Owner was a pleasure to deal with. Would totally recommend and our family will return. Everything you need and close to wineries and town. Stayed here for a weekend in September with a group of girls. We spent a lot of time in the back sunroom with the beautiful view of the lake. The kitchen was fully equipped with everything we needed. There was 7 of us and there was plenty of room for all of us to sleep. The only downfall was that we were not able to access the steps to go down to the beach area. We were all very happy with our stay. Would definitely go back! So glad that you had a good stay. Sorry that the gate at the top of the stairs down to the lake was locked, storm damage to the bottom steps has made them unsafe. We look forward to seeing you back again. Cancellation, no less than 30 days, will be refunded fully. Less than 30 days notice will receive a 50% refund.